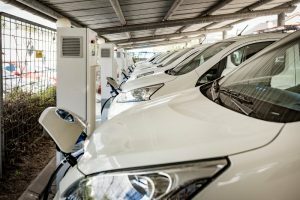 The UK government is to provide £20m funding to projects which will develop and test technology enabling electric vehicles to return energy to the grid during periods of peak demand. The funding will be provided to projects researching, developing and testing vehicle-to-grid technology. Provided by the Department for Business Energy and Industrial Strategy and the Office for Low Emission Vehicles (OLEV), the investment is aimed at supporting feasibility studies, industrial research and development and real-world trials. Vehicle-to-grid technology has the potential to reduce the investment in grid infrastructure required as the UK’s plug-in fleet continues to grow – it can help balance the load and avoid spikes in demand, using excess energy stored in vehicles’ batteries as a backup supply. Funding will be awarded through a competition process; applications will be invited during the coming weeks, and winners will be announced in December ahead of an early-2018 start. Support for vehicle-to-grid technology forms part of the government’s Industrial Strategy.